An intranet is an ongoing commitment that requires constant monitoring, adjusting, and measuring. Here are eight metrics to track to ensure the success of your solution beyond launch day. Design meaningful & actionable metrics with these 4 steps. Measurable data—whether you are an internal communicator or a CEO—is a powerful force. Having this information readily available helps you make smart decisions, implement quick changes, and uncover extraordinary insights. The challenge isn’t just collecting data, it’s collecting the right data. Many organizations fail at measuring the success of their intranet because certain statistics aren’t available, the data is misleading, or insignificant things are measured. Defining the right intranet metrics makes it easy to determine and measure success in your digital workplace. It also makes it so much easier to calculate a return on investment (ROI), which will inevitably please your leadership, and make you a star. But before we get into the actual intranet metrics, it’s useful first to understand the importance of segmentation. Segmentation is the process of dividing your intranet users into broad groupings based on shared characteristics (e.g. by department, location, or role). It allows you to understand what’s happening on your intranet and to identify key pockets of usage. Ideally, segments can map back to groups in your intranet software, so the membership of the segments can be automatically managed. If you are just starting out, we recommend keeping the number of segments small (5 to 7) and you can tweak from there. When looking at segmented key performance indicators (KPIs), it’s critical to look at the outliers, both positive and negative. For example, if marketing has a much higher reach than normal, try to find out why. Similarly, if a department is showing a much lower reach, try sharing success stories from other departments to inspire them on how to get the most from the intranet. OK, now that you understand segmentation, it’s time to determine your intranet metrics. Below is a list of all the key intranet metrics you should be measuring, why they’re important, and how to measure them. The number of users that are using your intranet for a specified period of time. This could refer to employees visiting your intranet, or viewing a specific document on your intranet. Reach could be measured per day, month, or year. 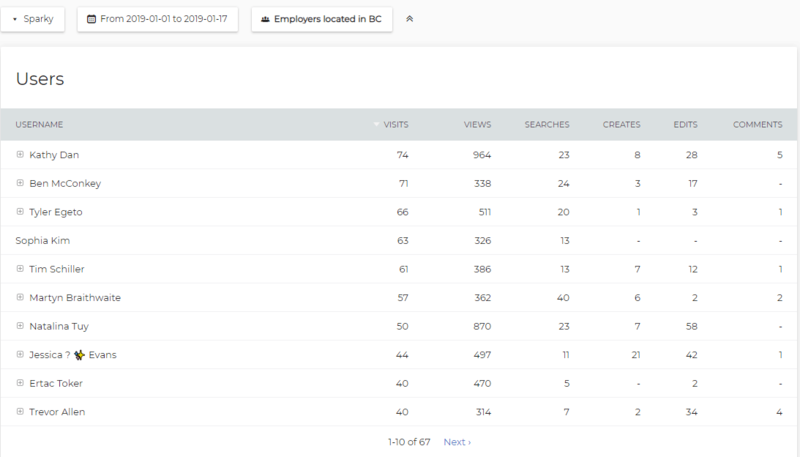 Reach is important to track because it tells you the percentage of employees that are actually visiting your intranet. It is especially important when you first launch your intranet, as it will provide a great baseline to start with. If you have multiple office locations, look closely at the visit percentages, or the visit numbers per location. Do some locations need more training or encouragement? Look at the visits and engagement rates per business division or department. Are some teams adopting the intranet faster than others? If so, why? Look at the number of unique views for important content like employee announcements, critical documents, or CEO messages. Are your employees reading what you want them to read? Most intranet solutions come with an intranet statistics package that will allow you to create a dashboard. With ThoughtFarmer Analytics, as soon as your users begin engaging with the platform it will record reach metrics. You can measure views vs users, as well as how many employees have read a particular post. You can also segment by location and department. Employees who use your intranet considerably more than others. This could include designated super users (chosen advocates who act as your intranet ambassadors) or employees who organically use your intranet on a frequent basis. Knowing who your engaged users are is useful when trying to understand engagement at a deeper level. This group can provide tangible feedback into what they like, what they don’t like, and what they may like to see changed. It’s worth leveraging these users to help train new users who may have questions or concerns. Having a highly engaged group of users is also helpful in identifying Communities of Practice (CoP) within your organization. Identifying your top users is usually quite simple. They often top the list of employees who frequently comment, create, and edit content. Using the Users report in ThoughtFarmer Analytics (see image above), you can easily identify these users. The report will allow you to easily view page numbers per user. Use segmentation to identify the champions in each department or location. Specific intranet metrics such as views, visits, bounce rate, average time on site, etc. This section refers to your general usage metrics. 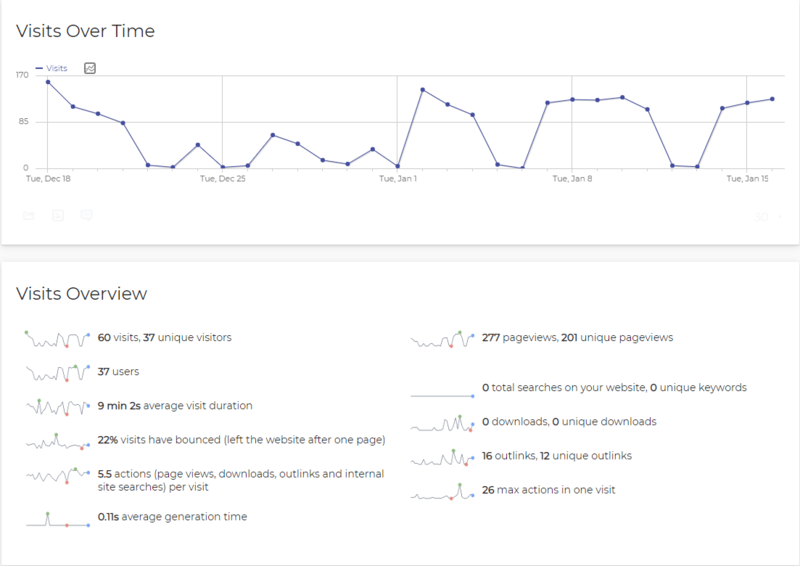 It’s sort of like the Google Analytics of intranet metrics. This can potentially provide a lot of insight into your users and your content – plus, for intranet analytics junkies, it can be fun! 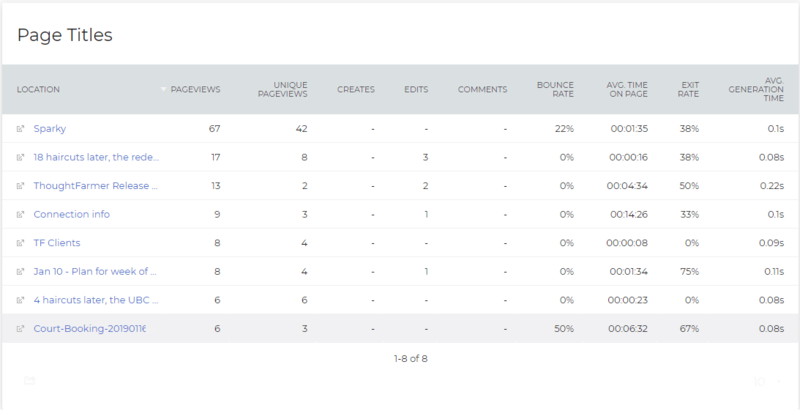 To track usage metrics, look at things like top users (see previous section), top commenters, top searches, top viewers, and top editors. You will also want to search for top keywords to understand what content your employees may be searching for. Once you have identified these groups, segment them in a way that makes sense to your organization; for example, by role, team, or location. How popular is your content? Your content’s popularity isn’t just determined by visits, but also by engagement, which includes such insights as shares, likes, and comments. Tracking these numbers can show the impact of a specific content piece. Tracking engagement of a post helps you learn which content has had the biggest impact and helps you plan future content pieces. Look closely at critical pieces of content (staff announcements, important pages, or shout-outs) and measure things like views, likes, comments, follows, subscribes, and even shares. As shown in the image above, tracking content engagement is a powerful way to measure visitor interactions other than page views. How much time employees save. This could be a marked reduction in email or time to complete a task or find information/documents. If your intranet isn’t solving a particular pain, what is the point? Intranets are intended to improve productivity and solve communication-related challenges, so why not measure it? Plus, calculating productivity can also help determine potential savings and an ROI. Employee surveys are a great way to discover improvements in productivity. Listen closely to staff for improvements and suggestions, and then make necessary adjustments so your intranet is even more helpful and awesome. If possible, you should also measure your email traffic, and examine whether or not it reduces after the launch of your intranet. This post lists some great examples for questions to ask on an intranet survey. Team metrics refer to groups, the number of groups, and/or the number of contributions from these groups. Your groups and teams are a significant part of an intranet and there are many metrics within the group worth measuring. Tracking this will provide healthy insights into how various groups and teams engage with your intranet. This is especially useful if you have remote offices as it can help determine which communities are more engaged than others. Many of the intranet metrics listed above (reach, usage, and top users) relate to community metrics. The next step is segmenting them, and zooming into how these specific groups are doing. Are some teams outperforming others? If so, what might the reason be? This is identified in ThoughtFarmer Analytics by using segments. A segment is a subset of the tracking data that is filtered down to specific criteria. Using segments, you can display just tracking data that is relevant to your reporting needs. Segments can be created via the ThoughtFarmer Analytics admin panel by defining segment name and criteria. Common usages of segments include: visitors from a territory, and returning users. How your intranet reduces internal costs. If you can determine how you reduced costs, you can demonstrate an actual ROI. Imagine how excited your CEO will be? After all, a well-implemented intranet should result in cost savings. You might be wondering where to start with this, but there are many ways to measure the potential cost savings. This could be things like a reduction in travel, or employee turnover. Or, it could simply be the elimination of other collaboration tools or applications that you no longer need. Start by identifying any tasks and processes that you have moved to your intranet. Did this result in cost savings for other tools or software you may have previously used? Also, try calculating the amount of time your employees are saving by quickly locating content and expertise on your intranet. Measuring key organizational objectives rather than against specific intranet objectives. Sometimes it’s important to see the forest through the trees, and if you are looking too closely at small metrics, you might miss out on the intranet metrics that reveal the bigger picture. The best metrics measure business outcomes, so it is absolutely worth measuring tangible KPIs like employee engagement. Your organizational metrics are individual to your organization. Define some key KPIs and identify the metrics needed to reach that target. From there, you can summarize your KPIs and targets into a dashboard to easily see if targets are reached. Include notes on key insights, actions, and steps being taken, as well as KPI definitions. Your intranet must measure what’s important to your organization – but don’t expect this to stay the same. Like your business, your intranet needs will grow and evolve. In the beginning, your focus might be about engagement and adoption. A few years later it might be around content and the quality of posts. Within ThoughtFarmer Analytics you can actually set specific goals that help identify and track business objectives. Goals can be created through the admin panel by defining goal name, goal type, and goal pattern. Goal name describes your business objective (e.g. sign up, view product demo). Goal type and pattern together define how the goals can be converted (matching a URL, downloads a specific file, clicks on an external link). Some common goal examples include: newsletter subscriptions, content download counts, product demo requests, and the number of profiles created or edited. As you can see, a successful intranet is an ongoing commitment that doesn’t stop on launch day. It requires constant monitoring, tweaking, and measuring. Built-in tools like ThoughtFarmer Analytics provide organizations with a clear snapshot of their communication and collaboration efforts but, more importantly, the reassurance that their intranet is working. Kelly Batke is a senior content writer for ThoughtFarmer. This article was originally written for the Digital Workplace Group, and has been republished with permission.